Day One – Rinse the kumquats, and prick each one several times – I find that stabbing them with a wooden skewer does the trick! Put them into a large pan and cover with water and cook for 40mins and then drain. Put the fruit back in the pan and pour in 1 litre of water and then leave it to stand in a cool place for 24 hours. Day Two – Remove the kumquats from the water, put to one side. Add 750 gms of the sugar to the soaking liquid and bring to the boil, stirring it to make sure the sugar dissolves. Allow the mixture to boil for 5 minutes, without stirring. Now return the fruit to the pan, remove from the heat and allow the mixture to stand again for 24 hours. Day Three – Divide the remaining sugar into 4 amounts (187.5 grams each). Again remove the kumquats, putting them to one side. Put the first of these smaller amounts of sugar into the pan, bring to the boil until the sugar has dissolved. Return the fruit to the pan and cook for 5 minutes. Remove from the heat. Again allow to stand for 24 hours. Day Four – Repeat the process of removing the fruit and adding the next amount of sugar, boiling until it dissolves. Then returning the fruit to the syrup, boiling for 5 minutes. Remove from the heat. Allow to stand for 24 hours. Day Five – Repeat the above process. Day Six – Repeat the above process. 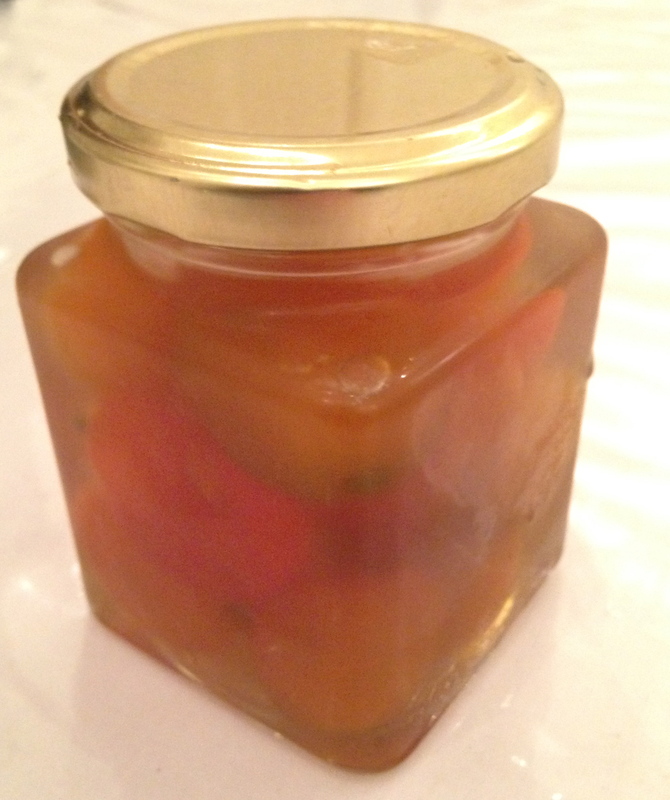 Day Seven – Do not remove the kumquats from the syrup just add the golden syrup. Cook for about 10 15 minutes making sure, of course, that the syrup doesn’t caramelise or burn. Remove from the heat. Allow the kumquats to cool in the syrup, gently shaking the pan from time to time. When the mixture is cool, transfer t sterilised jars and seal.